Pictured at last year’s debate are Niall Browne, CEO, Dawn Meats; Pamela Byrne, CEO of FSAI; Peter Garbutt, UK & Ireland Agriculture Manager, McDonald’s; and Tara McCarthy, CEO, Bord Bia. 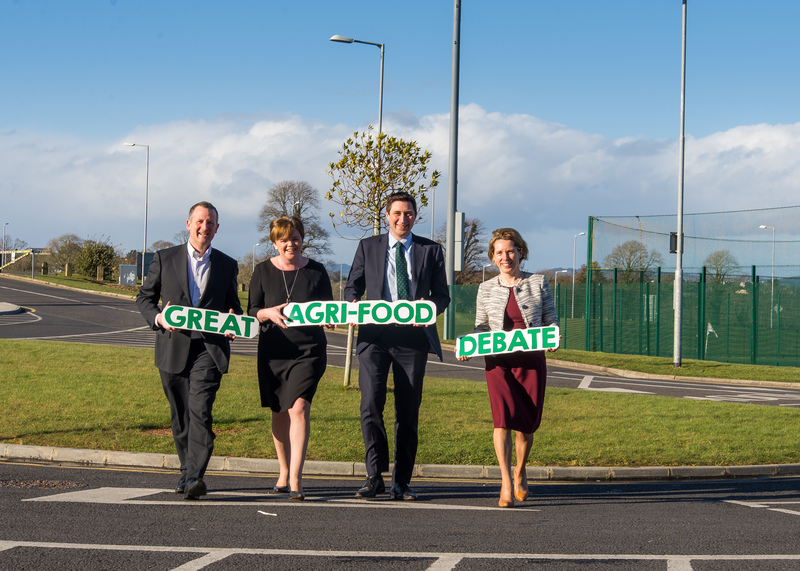 Students of food and agriculture at seven third level colleges north and south of the border will gather in Waterford Institute of Technology (WIT) for the 4th Annual Great Agri-Food Debate on Thursday, 14 February 2019. The Great Agri-Food Debate is a joint initiative between Dawn Meats & McDonald’s. Students from WIT will be joined by a record six other third level colleges to make this the largest Agri-Food debate so far. Teams from University College Dublin, University College Cork, Cork Institute of Technology; Queens University Belfast; IT Tralee; and CAFRE, Loughry Campus will make the journey to Waterford for the two-day event, featuring six debates, culminating in the final, in which students will debate the motion “Vegan diets are better for people and planet”. This year’s debate will take place at WIT’s Sports Arena on Thursday 14 February. The first semifinal debate will start at 10.30am, followed by another at 11.50, with the final to take place at 14.30. Last year’s Great Agri Food Debate was won by the team from UCD.